As we gear up for SEMICON West, we are encouraged by some good news in the industry after enduring the bleak news of autumn and winter. SEMI reports the North American semiconductor capital equipment industry book-to-bill was over 1.0 in February and March of this year (see Semiconductor Equipment Industry Book-to-Bill), and the PV equipment book-to-bill ratio is starting back up (see PV Manufacturing Equipment Book-to-Bill Increases from Record Low). With the good news comes more companies developing new equipment, drawing more attention to SEMI standards such as SECS/GEM and PV2 (PVECI). Understanding the SEMI SECS/GEM and PV2 standards, and the impact to their product roadmaps, might seem a little daunting for many equipment suppliers. We have updated a white paper to provide some background, called Introduction to the SEMI Standards: Implementing GEM and PV2. This paper highlights key elements and issues associated with GEM software projects to help guide users toward a successful implementation. A GEM (E30) interface is implemented by the equipment manufacturer to enable the equipment and factory software (a.k.a. “host”) to communicate using SECS-II (E5) messages via Ethernet. 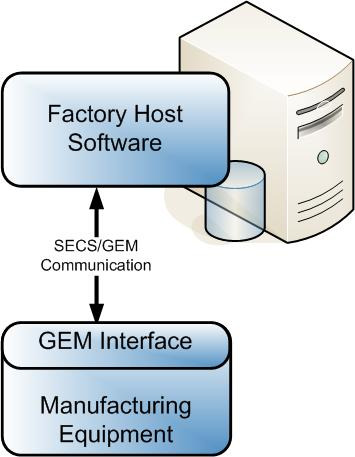 GEM standard compliance consists of fundamental requirements and additional capabilities, and compliance is only required for the equipment interface, not for the factory host software. Companies scale the GEM standard implementations to match the complexity of the equipment and the needs of the factory host software. The GEM fundamental requirements include establishing communication with the factory host software, implementing a processing state machine, event notification, protocol error messages, and a GEM implementation document. Here is an example of such a document, and you can find a GEM compliance check list at Are You GEM Compliant? These PV2 requirements should make PV2-compliant equipment even easier than GEM to integrate with the factory host software.